Almost Home recreates a scene that was familiar to anyone in Bomber Command. 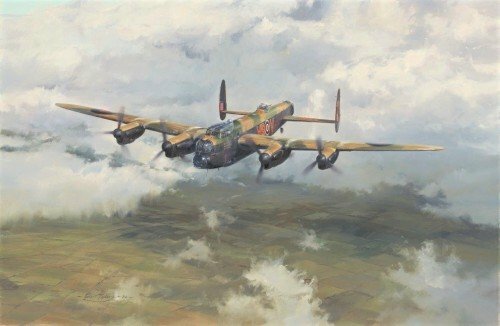 A lone 9 Squadron Lancaster, separated from the main force during a punishing mission to Germany in late 1944, returns to safety. The weary crew are no doubt relieved to see familiar fields beneath them as they approach their base at RAF Bardney. "…night after night, month after month, our bomber squadrons travel far into Germany, find their targets, often under the heaviest fire, often with serious loss, with deliberate, careful discrimination, and inflict shattering blows upon the whole of the technical and war-making structure of the Nazi power. 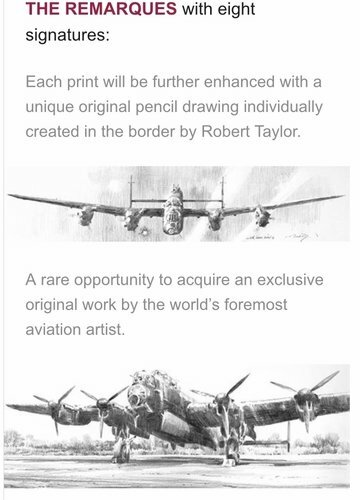 On no part of the Royal Air Force does the weight of the war fall more heavily than on the daylight bombers…"
This previously unreleased work was painted in 1984, the decade that saw artist Robert Taylor shoot to international renown as the world’s most widely collected aviation artist. Now released from archives, this timeless classic has been selected as the commemorative edition to mark the 100th Anniversary of the Royal Air Force on 1 April 2018.